Your integrated buyer's experience cannot only revolve around just marketing, sales or even web development. It's all encompassing. This is the intricate struggle of connecting with the modern buyer. Creating an integrated buyer's experience is the solution to this problem, but how do you go about it when there are so many variables and factors at play? What takes precedence and emphasis? The modern market has become so unpredictable that traditional salespeople have become less and less reliable to adequately sell your products or services. Buyers have become more aware with the internet readily available to educate them on any and every service, product and feature. The dichotomy between buyer and seller has taken a drastic shift in power, with buyers now dictating the terms and conditions of their purchases. HubSpot claims that any owner/manager who's tried their hand at sales knows that even the most experienced sales person is not a guaranteed solid seller. In the modern arena, their struggle has become increasingly diverse and abundant. 1. Value adding – Does your content or solutions add value? Are you able to build value through additional services? This is your opportunity to investigate and find where competitors fall short and add these elements to your offerings. 2. Business-critical needs – Does your solution(s) meet the business's critical needs? Will your solutions positively affect the business, and will it meet the needs of different buyers across their buyer's journey? 3. Competitive advantage – Does your business offer a unique solution? Does it hold a competitive advantage over other similar businesses in your industry? And is your offer enticing enough (be it your business model, customer service, product/service innovation, pricing) to be a differentiator? If you answered "No" to any of these questions, you'll have to relook at your marketing strategy, or consult with us on how to differentiate your tech company. As an Inbound Marketing agency that differentiates and engages, our buyer's experience is mapped out along the Four Legs of the Inbound Sales Journey. We ensure that the right buyer is served the right information, and appropriately delighted depending on where they are in the specific stage of their buyer's journey. 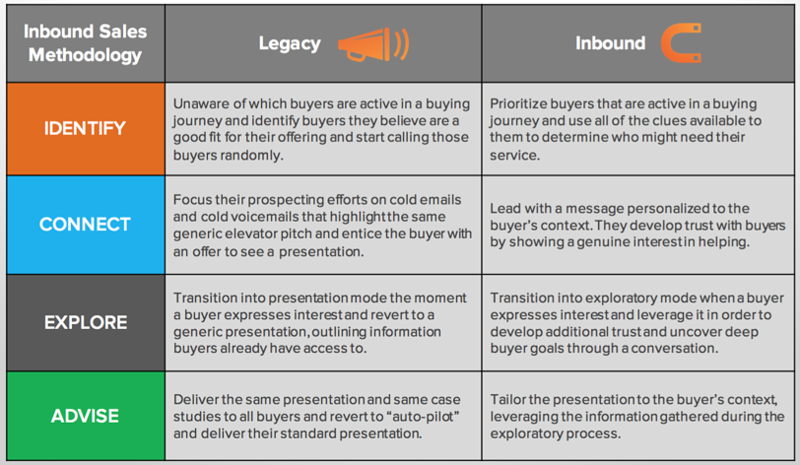 This is the key to differentiating yourself from Legacy Sales through the Inbound Sales Methodology. Identify - During this stage legacy sales people are unable to differentiate between a browser, or a prospect who is actively looking to buy. Inbound salespeople, with the help of technology and tools, already determine the level of interest of each lead and prioritises them accordingly. Connect - Pitches, demos, cold calling … all signs of a legacy salesperson going out of their way to find something that sticks. With inbound sales and marketing, teams only get in touch with leads who have indicated an active search or interest in a solution. Even then, no sales are discussed, instead the inbound way seeks to connect and build trust with the prospect - assisting (not selling) them in achieving their goals. Explore - The Explore phase sees the established credibility leveraged to increasingly pique the buyer's interest in finding a solution, all the while establishing the sales/marketing team as a trustworthy thought leader. This stage is pivotal in establishing if the buyer is a right fit, and if their needs or specific pain points can be met. Advise - Not having done enough research on their prospects, legacy salespeople set up this stage much earlier. This is where, like a shark smelling blood, they go into automated pitch-mode and try to sell, sell, sell. The stale, rehearsed pitch is all about their company, what their products can do, and how their solution is the best one out there.Inbound salespeople have already gathered enough information about the buyer to know exactly what they're looking for and if the company is a good fit to fulfill this need or not. Through the proper positioning of value and the right questions asked, the buyer is already guided to the right conclusion. Through an inbound framework, you are able to position your marketing and sales teams as reputable, knowledgeable, and trustworthy. Most of all, you'll appear more concerned about serving the customer's needs, than making a sale. That's where you'll really see your leads convert as they are delighted with your personal service (and can't wait to tell their friends). Visitors become leads, leads become customers, and customers become promoters; and so the cycle continues. In keeping with the Inbound Marketing methodology, we are able to build our clients’ brands this way. We create valued content that helps them get in touch with their ideal buyers, even with competing offers knocking on their door. We block out the noise by focusing on offering valuable service to the right customer at the right time.